Invented by avid skateboarder David Patrick, they might possibly revolutionize the concept of the wheel, which, as a mechanical design, has been pretty solid and unchanging for about 5000 years. This clever guy noticed that in nature, movement often manifests itself in repeating wavelengths: light, wind, ocean waves, and even human walking patterns can be mapped out into a series of consecutive high points and low points. He figured that nature was on to something, and looked deeper into this phenomenon. The recurring pattern could be directly graphed as the sine wave. After a ton of research and development, he came up with a design that integrated that sine wave onto the skateboard wheel. If you glance at it from an angle it looks kind of like a square. It has six flat edges that can fit perfectly in a hollow cube. But it’s also a complete circle. 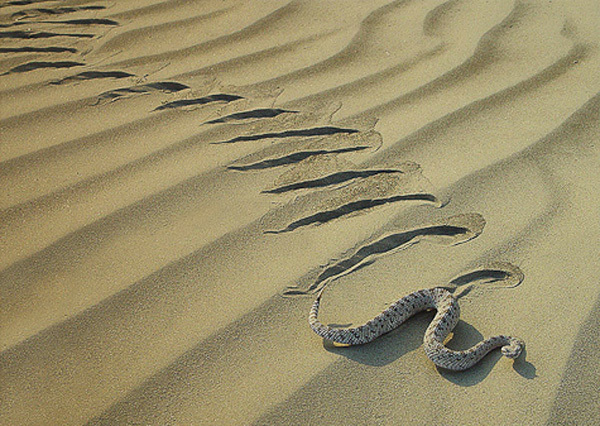 Think of a snake, and how effortlessly their bodies move across any terrain in a wave motion. The same goes for these wheels; the tread pattern glides over the ground and pushes any debris out of the way in a nonlinear path, rather than trying to roll straight over it. While normal wheels have one point of contact, this design has three separate points at one time, which give the wheels more longevity and even wear. The actual points of contact are narrow though, so there is less surface area in contact with the ground and thereby less friction, producing faster and more efficient travel. Another area where the design is superior is in the construction: this style uses 15% less material than a traditional design, making it more efficient from a substance perspective and lighter in weight. As a mechanical design, the uses for the wheel have become ubiquitous with daily life. But there are a few areas where wheels like this could dramatically improve business or personal safety. One of the biggest current uses for this wheel is in agriculture, and more specifically central irrigation (the big watering pipes on wheels). What can often happen is the wet soil can cause the wheels to lose traction, so they spin in place and get stuck in the mud. With this design, the wheels are moving out of phase like a DNA strand, so instead of getting bogged down even in mud the wheels can “crawl” over top of it. Another popular application for the Shark Wheel design is in the front casters of wheelchairs, as the current design is prone to easily getting caught on debris and small cracks. This not only makes it harder for the user to operate, but can also lead to a dangerous fall from the chair if the stop is abrupt enough. Skateboarder Gregory Rice reviewed these wheels and had some interesting observations and results, even when rolling over surfaces that would stop most traditional boards in their tracks. The only drawback with the current design is that it will only perform with a 4-wheeled vehicle. Because the wave pattern has three high points and three low points on the sidewall, any angle of tilt causes the wheel to lose traction and hit roughly on the peaks while skipping over the valleys. The Shark Wheels site has a bunch of videos showing these amazing wheels in action. If you have ever tried to ride a skateboard, you know how a pea-sized rock can end your fun REAL quick. Another rookie mistake make, usually only made once, is the ‘How well with this ride over grass?’ experiment which rarely ends well. So if you cringe just a little as this guy careens off the path unto the grass as you expect a face-plant, you’ll be surprised at how easily these wheels make the transition.